The Boston Athletic Association hosted its first Marathon Fan Fest over the weekend for competitors and fans of the Boston Marathon. The events leading up to the Patriots Day race began on Friday afternoon and continued through Sunday evening, as Boston locals and international visitors alike took part in the festivities. The Fan Fest was held in Copley Square, just a minute or so walk from the marathon finish line. Activities at the festival included musical performances, races for local students and meet and greets with former marathon champions. 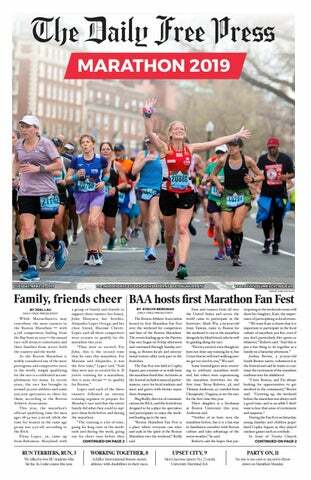 Meg Reilly, director of communications for BAA, said the festival was designed to be a place for spectators and participants to enjoy the weekend leading up to the race. “Boston Marathon Fan Fest is a place where everyone can relax and soak in the spirit of the Boston Marathon over the weekend,” Reilly said. We talked to two BU students who hit the 26.2-mile course this year. Achilles International Boston assists athletes with disabilities in their races. Men’s lacrosse upsets No. 2 Loyola University Maryland 11-8. No one is too cool or uncool to throw down on Marathon Monday. Bertha Vazquez, 40, runs toward people reaching out for high-fives during the race. People on the sidelines of the race supporting the marathon runners by holding up homemade signs for encouragement. Boston University students took part in marathon festivities while BU’s police and staff largely focused on safety precautions Monday, as the final stretch of the Boston Marathon cuts through South Campus and Kenmore Square. Dean of Students Kenneth Elmore and BU Police Department Chief Kelly Nee sent a school-wide email Friday that warned about theft, alcohol safety and structural risks surrounding crowded rooftop and decks for Marathon Monday. Nee said BUPD takes extra precautions with increased patrols during the holiday. “Many students celebrate along the marathon route, and it’s a great day,” Nee said.“We have to be careful of students who may overindulge, so keeping everyone safe is our priority.” Nee said BUPD cautions against overcrowding on porches and decks or watching the marathon from unauthorized roofs. “I have witnessed the results of collapse, and the injuries can be very serious,” Nee said. “Also many roofs are not permitted for occupancy, so please don’t go on roofs to watch the marathon unless they have authorized permission. Police will remove you from the roof for your safety.” Nee said BUPD would assist Boston Police in covering the gap area behind West Campus to ensure campus safety. “If you see someone in trouble, please call us,” Nee said. “Take advantage of the ‘Good Samaritan’ policy, and look out for each other.” William Gross, Boston’s 42nd police commissioner, released a statement on April 8 to Bostonarea college and university students that asked spectators to be aware of their surroundings and refrain from drinking or smoking marijuana in public, congregating in prohibited areas and bringing backpacks to the marathon. Loesje Ophuis, 24, of Cambridge, is escorted by a Boston Police officer during the marathon on Monday. “In conjunction with partners, both public and private, the Boston Police Department has developed a safety and security plan for the events to ensure both athletes and spectators who participate feel safe,” Gross said in the statement. “... The City of Boston takes pride in this event, and we ask that you to play a role in our effort to ensure that we are a shining example of good sportsmanship, pride and most of all resilience.” The Massachusetts State Police deployed about 7,000 enforcement personnel for the marathon, according to The Boston Globe, which included their four helicopters, an undisclosed number of plainclothes officers in the crowd, uniformed officers and members of the National Guard. The police also placed cameras along the route. An overview of Boylston Street near the marathon finish line, the area in which two bombs were detonated in 2013, killing three people and injuring more than 260.
seems thoughtful,” Cember said. “I feel like more can be on the actual act of running the marathon. It looks nice, … but I think it could be a little more substantial.” Jackie Ko, 23, of Allston, said she likes the design of the memorials, especially their placement near the end of the marathon route. Darlene Corkrum and marathon legend Joan Benoit Samuelson at an Abbott World Marathon Majors event on Saturday. A girl participates in hands-on science demonstrations with a staff member at the Museum of Science in Boston. A young boy in yellow science goggles looks up at a worker at the Museum of Science in Boston. The inside of the Museum of Science in Boston. Guest speakers and staff members at the Museum hosted a series of educational activities leading up to the Boston Marathon. A little boy gazes into a microscope alongside other kids at the Museum of Science in Boston. Athletes and spectators from around the world took the streets of Boston Monday for the 123rd annual marathon. Rastislav Stieranka, 45, raises the Slovakian flag in the air while running through Back Bay. Marathon runners turn a corner past Kenmore Square and approach the final stretch of the race. A man in a military uniform high fives people in the crowd during the marathon. Christopher Scutti, 27, throws his hands up in the air and yells during the race. Gaute Dag LĂ¸set, 34, high-fives a spectator while running through Kenmore Square. A competitor in the push-rim wheelchair division, passes under Charlesgate East and Massachusetts Avenue. A young boy in Boston on the sidelines of the marathon supporting the runners. Runners make their way down Commonwealth Avenue in the final stages of the marathon. Two girls support the marathon runners in Kenmore Square with orange foam fingers. People gather together on a balcony to watch the marathon from above. A push-rim wheelchair racer heads down the underpass on Commonwealth Avenue. Doo Hoi Kim, a 60-year-old from South Korea, spreads his arms and smiles while running the marathon. Erik Hinrichsen, 30, pours a drink into his mouth as he continues running. Elite male runners make their way along the marathon course. Marcel Hug, 33, passes through Kenmore Square in a push-rim wheelchair. of Achilles International and is proud to see other athletes and guides doing the same. “People start chapters of Achilles all over the world,” Mulaj said. “They help disabled people do marathons and runs, but it’s also a social place to meet up with your friends.” The original Achilles chapter was founded in New York in 1983, and the Boston chapter was founded in January 2013, just months before the Boston Marathon bombings. Buso said the organization’s New York headquarters wanted to make sure the Boston community was especially supported after the bombings. Buso said she has been a guide runner for the past five years, helping with marathons, half marathons, 5K and 10K runs. Working with both Achilles and the Somerville Road Runners, Buso is familiar with many people in the Boston running community — so much so that she said her friends sometimes jokingly call her “the mayor.” “Successful guide running is all about trust,” Buso said. “You have to trust your partner, the person who is running with you — communication is a really big part of it.” Buso said athletes with disabilities face challenges during races that able-bodied athletes don’t always necessarily think of. Guide runners are responsible for keeping track of their athletes, she said, encouraging them and making sure they have enough space. “A lot of people use the BAA 5K as a warm up for the Boston Marathon,” she said. “For the majority of the race, it’s incredibly densely packed and because it’s raining today [Saturday], the road will be slippery. Also, in races like this where people are sometimes listening to music while they run, they don’t always hear you coming.” Jason Savageau, one of Achilles’ athletes, ran the BAA 5K with guide runner Lori Chong to prepare to run the full marathon. Savageau, who has a visual impairment, said he would run the marathon with two guides, who would switch off halfway through the race. “I took it very slow-paced, and my guide runner kept me upright and on pace and made sure I wasn’t burning out my energy before Monday,” Savageau said. “The guide and athlete both have to understand what’s important to the athlete. For me, I have more usable vision than a lot of completely blind runners, but with that said, it’s important that they understand what I need help with.” Savageau said he has been running with Achilles for the past two and a half years. Participants in the 2019 Boston Athletic Association 5K were cheered on by Achilles International Boston, an organization that pairs volunteer “guide runners” with member athletes who have a disability, on Saturday. Sophomore infielder Marina Sylvestri in Saturday’s game against Colgate University. Sylvestri hit a walk-off bunt that allowed the Terriers to sweep the Raiders on Sunday. escape the inning without further damage, but the ball game was set anew. The bottom of the sixth and the top of the seventh would not see any hits from either side, but BU would send their fans home in the bottom of the seventh with a walk-off hit from sophomore infielder Marina Sylvestri. A single from senior catcher/infielder Alexa Ponce began the rally, with junior pitcher Kali Magane being replaced on base for Ponce as a pinch-runner. A wild pitch would allow Magane to advance into scoring position at second base, which set up the perfect opportunity for Sylvestri. The sophomore infielder placed a bunt that rolled past the charging pitcher and first baseman and allowed Magane to bring in the winning run. “I think Marina showing bunt just made them want to throw a rise ball … to see if she can pop it up,” Waters said. “I never thought we’d win on a walk-off push bunt, but we’ll take it.” What’s next The Terriers will take on UMass Lowell in a doubleheader Wednesday at home. The River Hawks (20-12, 8-0 America East) have come off of a series sweep of their own over the weekend against Binghamton University (14-21, 3-8 America East). foot on the gas pedal after the third quarter, and I think we did a great job,” Polley said. “We continued our transition and stayed in the 10-man ride, which was key.” The fourth quarter began with McSorley making a routine save. The Terriers had the opportunity to expand their lead to six in a man-up situation, but Loyola’s Stover made an exceptional save to give the Greyhounds some life. Loyola attack Kevin Lindley stopped the Greyhound’s drought by scoring in a man-up opportunity, which closed the gap to four goals. Senior attack James Burr in a game on March 21 against Harvard University. Burr became the men’s lacrosse program’s all-time points leader in Saturday’s upset win against Loyola Maryland. University student Lingzi Lu, and more than 260 were injured due to the actions of terrorists who targeted a major American hub. Out of this tragedy came the slogan, “Boston Strong.” This slogan is in many ways similar to the American flag. Not the colors, stars or stripes of the flag, but the real meaning behind it: strength and pride. Marathons are about the ability to reach excellence and work tirelessly toward a seemingly impossible goal. That is what Romanchuk did on Monday, and we should not remember his name because of a crumpled up flag. Rather, we should remember him for the strength he demonstrated and for the pride he has bestowed on the city of Boston and the United States of America. 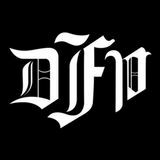 47th year | Volume 95 | Issue 7 The Daily Free Press (ISSN 1094-7337) is printed Thursdays during the academic year except during vacation and exam periods by Back Bay Publishing Co., Inc., a nonprofit corporation operated by Boston University students. No content can be reproduced without the permission of Back Bay Publishing Co., Inc. Copyright © 2019 Back Bay Publishing Co., Inc. All rights reserved. involves food, and I believe people should take it more into account when planning out their day. What’s better than a slice of pizza from T Anthony’s at 2 p.m. after an entire day of skipping through rat city? Absolutely nothing. The way the cheese cascades down the lower half of your face — slightly messing up your foundation, but this is beside the point — and hitting your taste buds with the thing they crave most: carbs that aren’t liquid. This is a thing of beauty. Next year, appreciate every bite. Next, the people. Humanity is a spectacular thing, and everyone coming together on Monday was just one example. No one is too cool or too un-cool for a good time on Marathon Monday. Yesterday’s holiday was one of the only times everyone forgets about their cliques’ parameters. I will admit I’ve met some great friends because of Marathon Monday, and the culture of the event makes that happen. If you didn’t do it in 2019, make sure to just stop in the middle of all the festivities next year and watch the people around you. In Marina Keegan’s piece, “The Opposite of Loneliness,” she writes, “It’s not quite love and it’s not quite community; it’s just this feeling that there are people, an abundance of people, who are in this together. Who are on your team.” This is how I felt on Monday. Everyone comes together and supports one another. Sure, the reason for all the togetherness is slightly shallow, but I’m willing to look past that. This feeling, this opposite of loneliness, is what I want to feel when I receive my diploma in May. Instead of worrying if I’ll trip in my new shoes, I want to look out at a sea of people I don’t know and feel support. Monday was emotional at around 3 p.m. The real reason I was down in the early afternoon was precisely the reason I was also feeling happy — an air of fellowship. It occurred to me that I want every day until graduation to hold some meaning. I don’t want to waste it, and to me, that means being with the people I love and making sure they know they’re loved. Marathon Monday was the beginning of the end for me, and while that’s sad, it’s also something beautiful. I hope you appreciated Monday, and today and the days after this. Here’s to something great. thing exciting about something so absurd. But it’s a short-lived excitement, smothered by our own perception of reality. About a year ago, I ran into a Nike-clad woman in a hotel elevator. When she asked me if I was in Boston to run the marathon, I looked at her like she was crazy. But all she said was, “If I can do it, anyone can.” I wasn’t convinced. In middle school, when I ran/walked a 14-minute mile during the dreaded gym test, I just assumed that I would never be able to do much better than that. Running was hard and uncomfortable, and I didn’t enjoy it. Apparently, I could never be good at it. I simply accepted the fact that I was fated to fail at something so challenging. It seemed to me that you either had a five-minute or 15-minute mile, and there was very little you could do to change that. Some people are just born faster, right? Of course, this is not true. While some people might be at an advantage for running one, or two or 26 miles, that does not make it impossible for anyone else. Even the kid who got a five-minute mile in middle school gym class couldn’t randomly wake up one morning and run an entire marathon. It takes dedication, purposeful intent and a lot of training. But even still, we assume we would never be able to run a marathon, even though most of us have never made any effort to do so. There’s a major difference between not being able to run a marathon and not wanting to run a marathon. We usually assume that we’re incapable, due to the daunting nature of the task and our profound lack of experience. But the woman I met in a hotel elevator was completely right. Running a 26-mile marathon is not impossible, even when you start out with a winded, exhausted, 14-minute single mile run. The same is true for the seemingly ridiculous aspirations we have. When we’re not instantly perfect at something, it’s too easy to assume we’ll never be good enough to actually make it an accomplishment. But anything challenging takes time, dedication and an open-minded attitude. I don’t have to run a marathon to know it’s not easy. But I can’t say it’s impossible if I haven’t even tried. Tens of thousands of athletes trekked 26.2 miles to downtown Boston on Monday. We here at the ol’ Free Press want to know — what would BU students run 26.2 miles for?